Please read "Seller Notes" at the top side of this page, I write each item conditions. Item condition has 8 levels, shown on the item titles, “New" - “Mint" - “Great" - “Good" - Normal (No Marks) - As-Is - for Repairs - for Parts. FEATURES * Focus 80-200 mm. * Angle of view about 30-12 degrees. * Relative aperture 1:4.5 (up to 1:22 with 1 f-stop clicks). * Special lever allows to close and open aperture for focusing. * Lens mount M42 (known also as Pentax Screw Mount), same with huge quantity of lenses for old Practica, Pentax, Yashica, Cosina and other cameras with optical registration 45.5mm. * Mounting for modern SLR & dSLR cameras will not bring any trouble with well-spread M42 adapters. * Resolution of the lens (in pairs of lines per 1mm) is varies at different length of the focus, it is not less than 36 in the center and 20 on the edge of frame. * Focusing from 1.5m. * Scale of distances in meters. 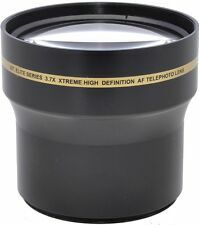 * Filter mount M 58x0.75mm. * The lens was made in USSR (Ukraine) at Arsenal plant in 1981. HIGH DEFINITION DIGITAL LENS. Microfiber cleaning cloths for cleaning all types of lenses and screens. Leave no marks behind. Ultra-Fine microfiber cloth attract, lift and hold dirt, dust And grease. One (1) M42 rear lens cap. One (1) 67mm front lens cap. 58MM X. 43 WIDE ANGLE WITH MACRO. Three Piece Filter KiT 58MM. 58mm Snap-On Lens Cap. CANON 58MM Rebel T5i Rebel T4i Rebel T3 EF-S 18-55mm f/3.5-5.6. 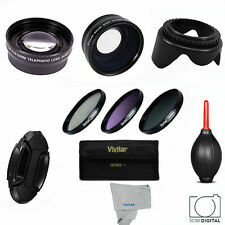 Essential Lens Set & Filter Kit for 58MM Canon Rebel T4i T3i T3 T2i T1i XSi XS (#230951045018).